Learning new languages to build web pages is hard enough without having to dream up content. Let's put your new HTML skills to use by developing a web page about either your hometown or a city/town that you are familiar with. Click the link above and follow the same steps as you did in the orientation lab to clone the repository and get started. This repository already has a blank index.html file for you to start with. Establish the framework for a new HTML document as discussed in class including the DOCTYPE, html, head, and body tags. Add a title tag to the head portion of the file with a value of An Insider's Guide to YOUR_CITY_NAME (e.g. "An Insider's Guide to Lexington, VA"). The name of the city/town in a level 1 heading tag similar to what's in the title element above (e.g. "An Insider's Guide to Lexington, VA"). Add a div set of tags. Within the div, add the word "Population" in bold followed by a colon and the approximate population in normal, non-bold text. This should be followed by, in italics, the year the population numbers are from surrounded by parentheses. Place one set of header open and close tags around both the heading with the city's name and the div with the population. Create a section with a brief introductory paragraph about the city inside that section. Start a new section containing another header element further containing a level 2 heading of "Some Facts about CITY_NAME". The body of the section should be an unordered list of three commonly known facts about your city. Start another new section containing another header element further containing a level 2 heading of "Only Insiders Know...". The body of the section should be an unordered list of two things that are lesser known things about your city that only someone who lives there might know. Start a third section containing another header element further containing a level 2 heading of "Top 3 Things to Do or See". The body of the section should be an ordered list of the top three things that you would tell a visitor to see or do there. 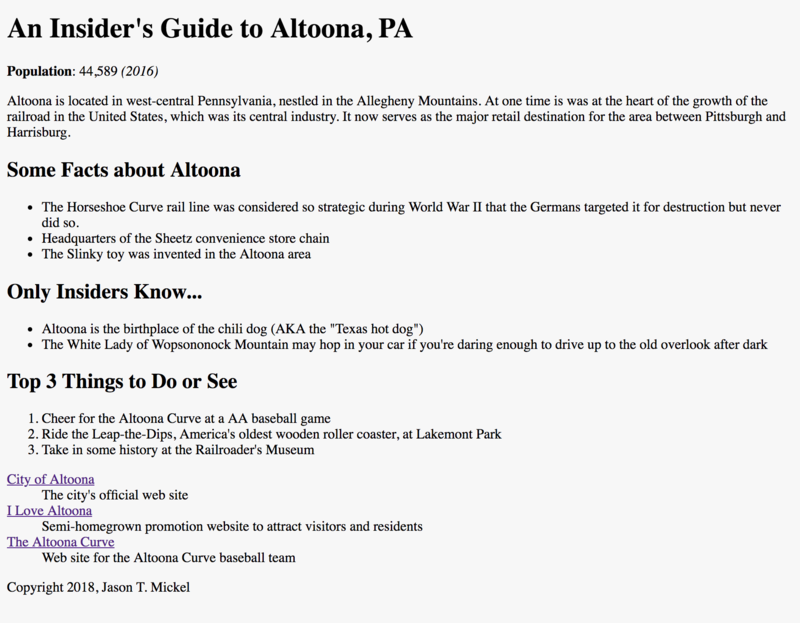 Start a final section with a description list of three websites related to your city. The description term should be the name of the site with a link to that site's URL. Each link should open in a new window. The description definition should offer a brief summary of what the site is about or covers. Have you checked that your links actually work? Create a footer section with the word "Copyright", the current year, and your name. Use GitHub desktop to commit and sync your project by completing the steps listed in the document from step 1 above. HTML should be properly formatted following the style conventions discussed in class. Be sure to check the live URL at https://dci110w19.github.io/insiders-YOURUSERNAME (e.g. "https://dci110w19.github.io/insiders-mickelj") to see that it is completely uploaded and working. The lab will begin with a full score of 50 points and deductions will be made according to the amount and severity of errors.